Performers include: Anna Maxwell Martin, Rachael Stirling, Sophie Rundle, Julie Graham, and Hattie Morahan. It’s London 1952, seven years after the end of the Second World War, and four women reunite to track down a serial killer. 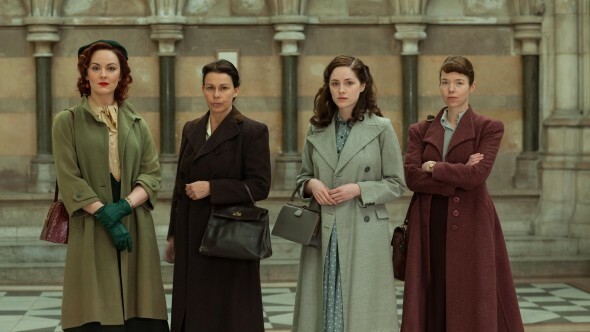 Using the same skills they used to break Nazi codes at the top secret Bletchley Park (which made them a crucial part of the allied war effort), the four women are also coming to terms with what is expected of them in their mundane lives. Now a housewife and mother of two, Susan (Anna Maxwell Martin) sees a pattern emerging when a number of women are brutally murdered. She quickly enlists the help of her former colleague Millie (Rachael Stirling) who has recently returned from traveling the world. Independent, single minded and adventurous, Millie is a progressive alternative to the stereotypes of that era and helps bring the other members to the fold. Enter youngest member Lucy (Sophie Rundle), who has a photographic memory and unique ability to process data, and their former supervisor Jean (Julie Graham) who’s now a librarian with a knack of being able to source sometimes secret information, which will become invaluable to the team. One problem is that Susan’s unknowing husband Timothy (Mark Dexter) is becoming increasingly suspicious and frustrated with his wife’s theories as they collide with his own career ambitions. Jasper’s murdered but, thanks to corruption, no action is taken by the police. To catch the criminals and stop the trafficking of girls, the ladies plan to buy contraband. Lucy is able to memorize the gang’s encrypted ledger book. They return to Bletchley Park which is now a college where Alice’s daughter is studying. They intend to take a Typex machine but find an old Enigma machine instead. First aired: May 4, 2014. What do you think? Do you like The Bletchley Circle TV show? Do you think it should have been cancelled or renewed for a third season? Unbelievable that this wonderful show has been canceled! My husband and I ate big fans. It was one of our favorite shows. Shame on PBS. It is a shame that this series had ended. Very interesting show, characters, and subject matter. Great Show, sorry to hear it is not returning. It is sad that The Bletchley Circle went away. It was a good show and I would like to have seen more of it. It is my guess that during WWII and WWI the people (girls and guys alike) did their fair share! I bought this series after catching a rerun on PBS. I was hooked and had to see the rest. After I received it, my husband was teasing me about it a bit (I am a math person myself) but as I sat to watch it, he was captivated as well. We binged on the 7 episodes in 2 days…..now I am very sad to find out there are no more episodes. What would it take to bring this series back?! Definitely RENEWED!! I was very disappointed to read that this smart, well written and well acted show was cancelled. There is a huge audience that will be very pleased to see this show develop a third season. What can the fans do to make this happen??? I watched this series again over the past two days. What an excellent show. Smart, strong women suddenly out of meaningful work and having to find their way in a new world. So thoughtful and thought-provoking, like Foyle’s War (another gem lost). There are no other shows like this; no intelligent and independent women ensembles. And yet, Call the Midwife flourishes. If Ripper Street came back, surely someone could resurrect The Bletchley Circle.